Nema 4X - Solution Control Systems Inc. Nema 4X - Solution Control Systems Inc. 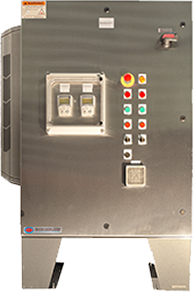 These packages are also very similar to nema 4 packages except the enclosures are made of stainless steel for corrosive environment. The cooling means i.e air conditioners are also rated for nema 4X rating.